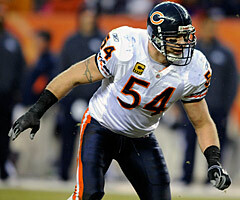 Published: June 27, 2012 at 04:22 p.m.
Brian Urlacher fully expects to be a free agent for the first time in his NFL career after the 2012 season. But he says he's at least a few years away from calling it quits. Urlacher, who says he'll be ready for training camp after missing organized team activities with a knee injury, told ESPNChicago on Wednesday that he expects to play two to three more years. Just don't expect it to come with the Chicago Bears' biggest rivals. Asked if he'd ever play for the Green Bay Packers, Urlacher flatly said no. But what if they offered two years and $20 million? "That's a good deal," Urlacher said to laughter. Throughout the interview, Urlacher stressed that he hopes and plans to stay with the Bears, who drafted him in the first round (ninth overall) in 2000. But it won't be an easy contract to figure out. It's never easy to sign franchise legends at the end of their career. "My back feels great, my neck feels good, my muscles aren't pulling anymore, so that's good," he said. "Everything feels pretty good right now. I always say (I want to keep playing) two to three more years. It all depends on how I play on the field, because if I don't play good enough nobody is going to want me." Teams will want Urlacher. But he'll have to prove he can stay healthy and play at a high level or he's headed for a drastic pay cut.